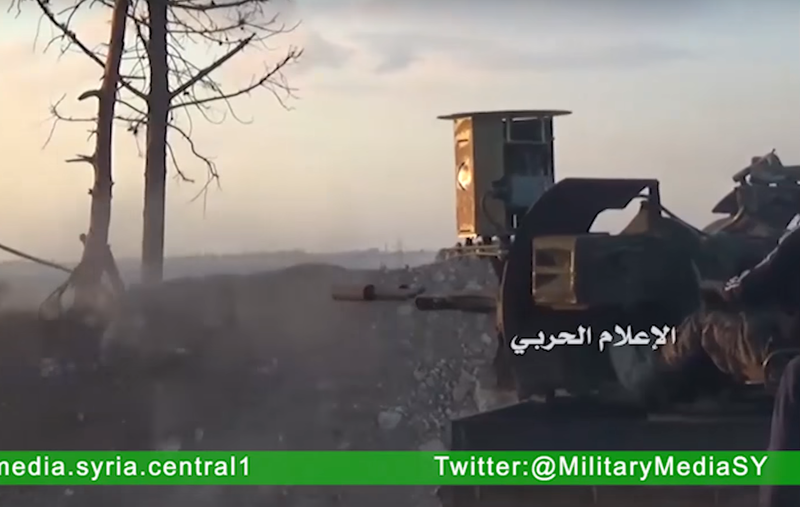 Recently a series of videos was uploaded by a pro-regime media outlet that purported to show operations near Khan Tuman, south of Aleppo, Syria. The videos are mostly of anti-aircraft guns in pickup trucks (technicals) firing wildly at targets unseen, but some clips show behind-the-scenes information about the war that you cannot really see any other way (short of flying there and viewing it yourself, not recommended). The first video starts off strong with a short clip of a rather modern-looking main battle tank driving away from the camera. 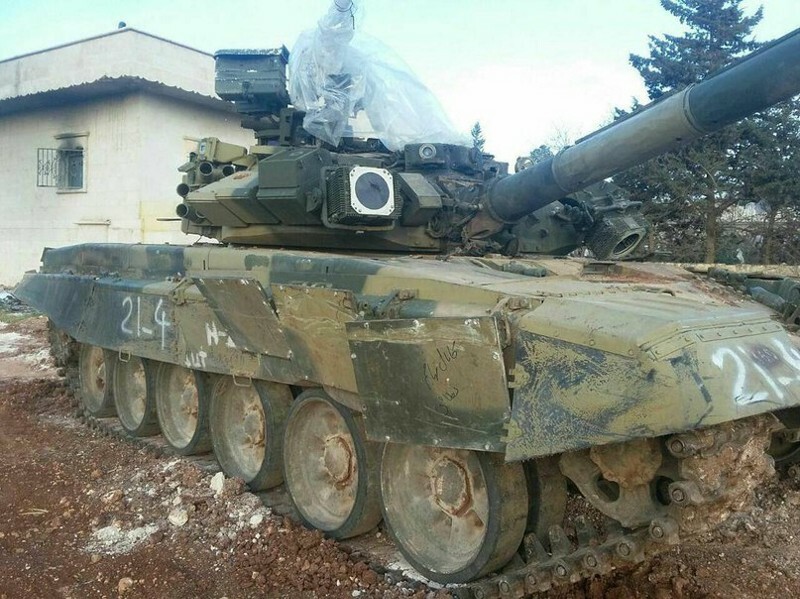 Closer examination determines this to be a T-90, a tank only recently introduced into Syrian stocks by the Russian military. There is very little information on the T-90 operations in Syria, other than one got hit by an American-made missile and survived. Of interest is the marking on the side of the vehicle, a white spray-painted “21_6”. This is the vehicle’s only identifying marker. What gives the vehicle away as a T-90 are a few of the details on the turret. In particular, the slanted Kontakt-5 explosive reactive armor (ERA) near the barrel, while also seen on some models of the T-72 (Such as the T-72B3), is a rather easy way to call attention to the tank for closer examination. However, unlike the T-72B3, the T-90 also features another level of protection in the form of 3D6 smoke grenade launchers on either side of the turret. In addition, barely visible in the video screenshot is the outline of the Shtora active protection IR “dazzler”, right alongside the barrel. 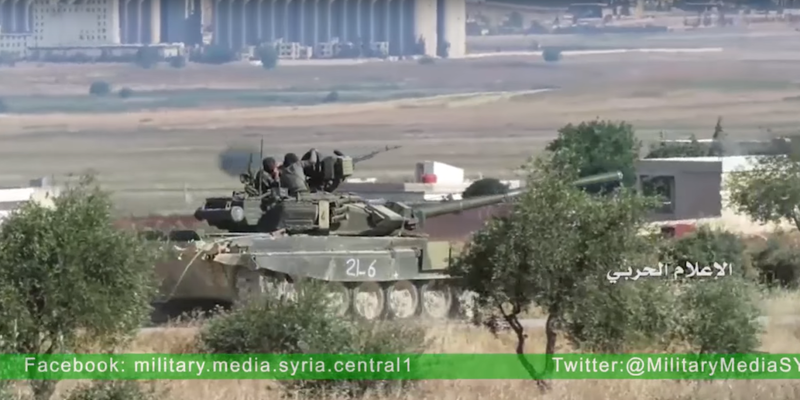 Finally, we know this is a T-90 based on those pesky markings on the side. The second video starts with an interesting shot of a T-55 spinning in a circle. The immediate giveaway identifying this as a T-55 is that telltale gap between the fourth and fifth road wheels, unique to the T-54/55. The vehicle in question is in rather good shape considering its age. 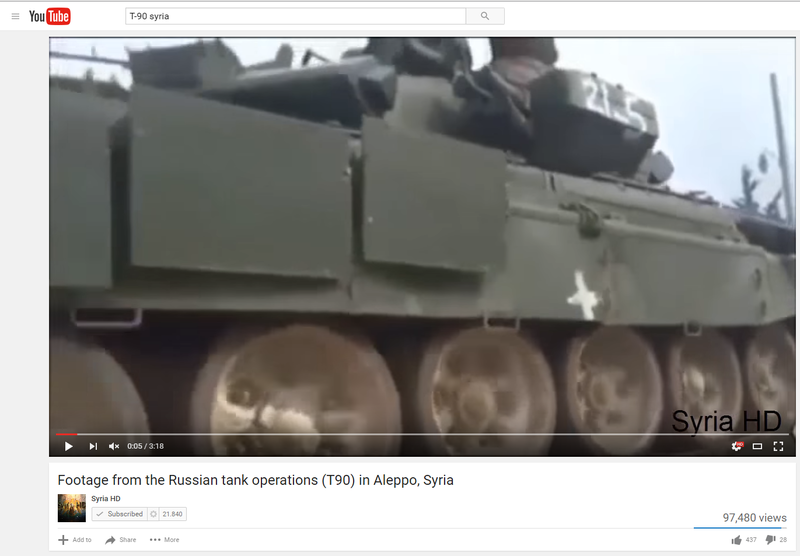 As previously discussed, the T-55 has a very long history with Syria, and these tanks are likely no different than the one in the linked article. That said, not all Syria T-55s are created (or maintained) equal. All these details tell us this tank is in service, very much active and likely in the hands of a rather capable crew. Of final note in the video was an object which appeared on several SAA technicals, a device known as a “Syrian Tophat”. The device is allegedly similar to Shtora, designed to “blind” infrared-seeking missiles and causing them to go wildly off course. Their effectiveness is not really known, and while they undoubtedly cause trouble for older models of ATGM, it is unlikely that they have any impact on more modern designs. Syria is and will continue to be a playground for Russian military equipment as the Russian Ministry of Defense tries out all of their newest toys in an active battlefield.